Benefit from using both sides of the card to promote an area business or yourself. two-block radius. The response has been great. This has been some of the best marketing that we have done for the past 3 years. We will put your message in the hands of every hotel guest ...Guaranteed!!! Everyone who checks in at the hotels you choose receives your advertising message… GUARANTEED! Everyone that travels has to eat a majority of his or her meals in a restaurant. The number one question a traveler asks the front desk person when checking in is, “Where is a good place to eat around here?" You do it, I do it and your next customer will do it too. Why not have the hotel give the traveler a copy of your menu, or directions to your shop. 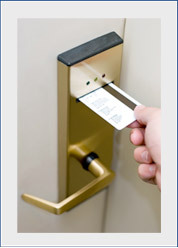 With key card advertising, every hotel room guest gets a copy of your ad. Every customer, every day. Custom hotel key cards are a highly visible vehicle to deliver important messages that you want guests and event attendees to remember. These interactive products are often viewed 5 – 10 times per day – we try to help you get the most out of those impressions! Don’t miss a great chance to be seen and remembered! Without a doubt “Key Card Advertising” is the best way to reach the lucrative travel market. And it pays for itself. How much of this multi-million dollar market do you want? Key Guarantee is in 25 major U.S. markets and adding more every day. We can put your business in front of many travelers at the right moment - right after checking into the hotel and before they decide where to eat or what to do. of hotel key cards, Key Guarantee helps you extend the reach of your marketing campaign.